Derrick Kosinski & Scott Yager are joined by The Nolan Twins, Liz & Julia. Liz (@_LizNolan) and Julia (@JuliaNolan_) Nolan competed on Big Brother Season 17 pretending to be one person for several weeks, tricking their fellow housemates and switching places in the diary room, where they would download each other on the particulars and specifics necessary to keep up the charade. They were eventually allowed to play the game separately and revealed the "Twin Twist" to the house ... See More after they passed the initial test. When it was all said and done, Julia came in 6th and Liz came in 2nd place on the season, coming just short of the $500,000 prize. War of the Worlds marked both of their debut on The Challenge. Liz went home in the first purge challenge, so her time was very limited. Julia however, stuck around for a few weeks with her partner CT. The twins join Derrick (@DerrickMTV) and Scott (@SHOTOFYAGER) for a super fun chat about competing on both shows together, what it's like having a twin in life and on TV, who they liked and didn't like on The Challenge, which Challenge Vet that one of them has a romantic past with and MUCH MORE! Cue the air horn! 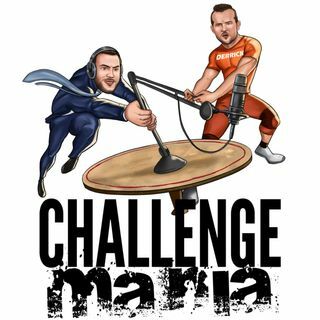 If you want MORE Challenge Mania, check out www.Patreon.com/ChallengeMania where we drop Bonus Episodes every week. Last week we dropped a 2+ Hour Bonus Podcast that includes a special 20 minute guest appearance by Cohutta Grindstaff. The Challenge Mania Shop is always open at www.ChallengeMania.Shop - It's the best way to support the podcast while looking good doing it! Brooklinen is giving Maniacs 10% OFF their first order AND FREE SHIPPING if you go to www.Brooklinen.com and use the code MANIA. These sheets are utterly amazing. Incredibly comfortable. That's a shoot!